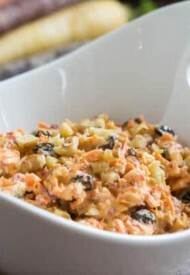 I have to admit I’m totally not used to sweet carrot salads with raisins and such. 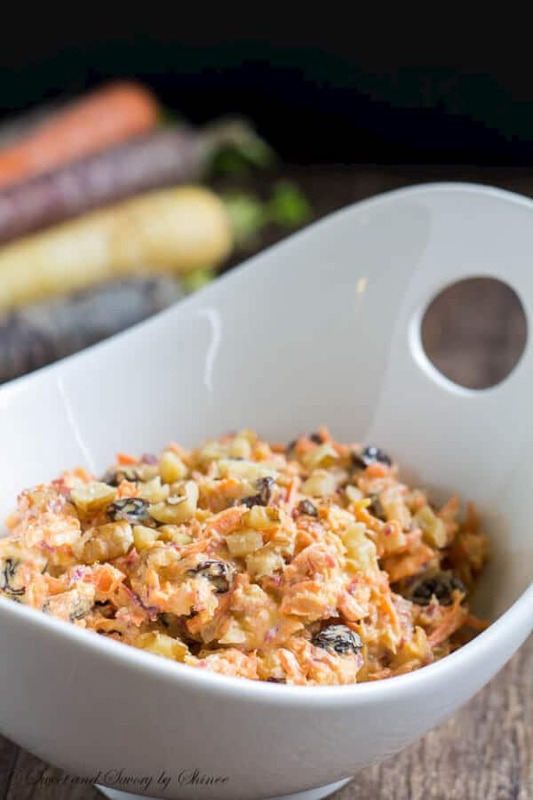 I grew up eating creamy garlic-y carrot salad my entire life. Yes, it’s savory and delicious. 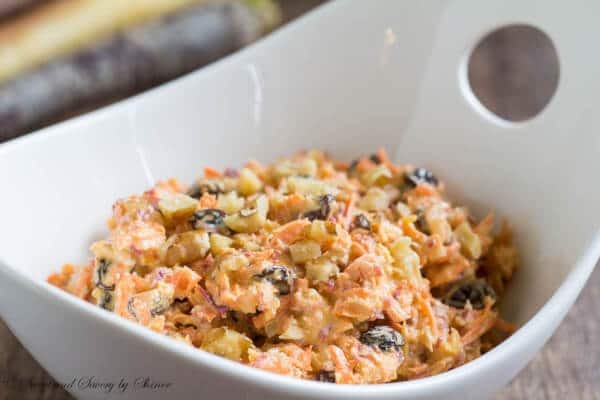 When I brought two carrot salads to the ranch recently, one sweet and one savory, everyone was telling me that carrot salad should be sweet and creamy! And they wouldn’t even touch the savory stuff. 🙁 That’s ok, it wasn’t even my usual salad, just an experiment. 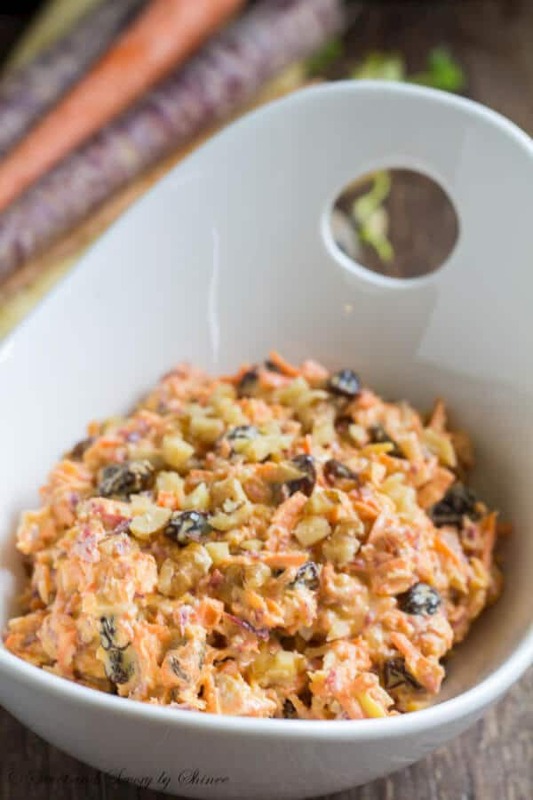 So based on everyone’s feedback, I tweaked the sweet version and came up with this wonderfully creamy, sweet and tangy carrot salad. I didn’t hear a single complaint! And did I mention, there is no mayo in this salad? As much as I love mayo, I try to avoid it during hot summer days. Not safe, especially if you’re preparing it for picnic, or outdoor BBQ parties. When I was shopping for cream cheese the other day, I came across this new thing, called Greek yogurt cream cheese. I bought one package out of curiosity, and I loved it. It’s slightly sweeter than the regular one, and definitely lighter. That’s what I used in this recipe, but you feel free to substitute regular cream cheese. 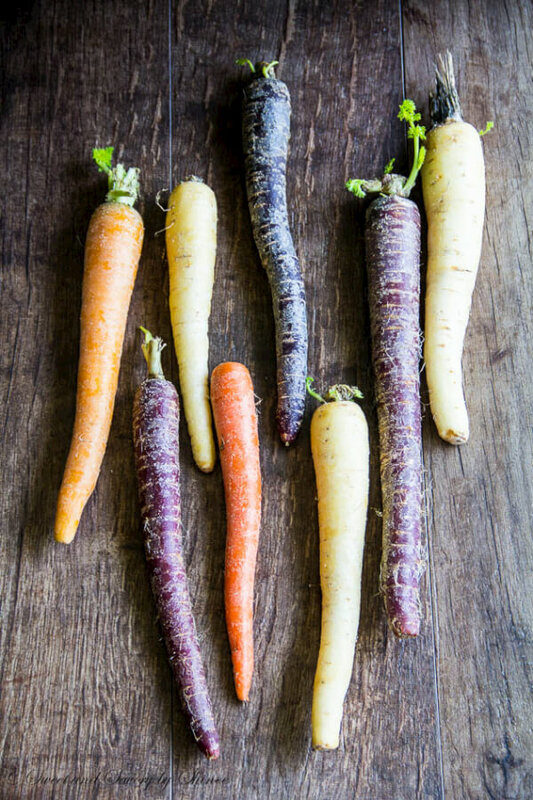 Let’s talk about another star of this recipe: Rainbow Carrots! Have you tried them yet? They are absolutely delicious! Roasted is the best way to go. However, it’s great for this salad as well. In my opinion, they are not as sweet as the regular carrots, but they are more anti-oxidant rich and beautiful! 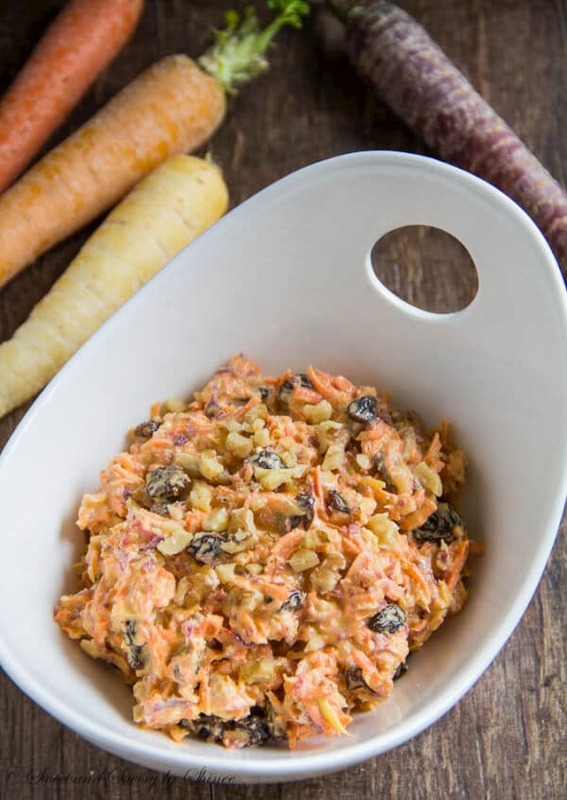 Wonderfully creamy, perfectly sweet and tangy, this carrot salad is absolute must-try! Oh, and there is NO MAYO! 1. In a medium bowl, mix all the ingredients until well combined. Best to make this salad a day in advance and refrigerate overnight for the flavors to blend.